Are you all set for the first film of 2016? Asim Raza's Ho Mann Jahaan stars Mahira Khan, Sheharyar Munawer Siddiqui and Adeel Husain in a story about young love and ambition. 1) The 'college kids' look isn't as effortless to achieve as it seems! Three look tests were conducted for Ho Mann Jahaan's main cast (Mahira Khan, Sheheryar Munawer Siddiqui, Adeel Husain and Sonya Jehan) before their final looks was locked in for the film. A photograph from the first look test was also used in the film as a college poster. 2) Mahira Khan grew her hair long(er) for the film. 3) While Mahira had the easier job of lip-synching, Adeel and Sheheryar had to learn how to play their instruments. Adeel learned to play drums and Sheheryar learned to play the guitar. They were taught how to play their instruments by indie musician Daniel Arthur Panjwaaney. 4) There are three more celebrity cameo appearances in Ho Mann Jahaan, which are yet to be revealed. 5) The jewellery for the film has been custom-designed by Amber Sami, and designers Umar Sayeed, Feeha Jamshed and Ismail Farid designed the wardrobe for the film, keeping in mind the look of the characters. 6) Ho Mann Jahaan is the first Pakistani film for which Zoheb Hassan recorded a song. 8) The same set was badly affected by an unexpected downpour in Karachi just six days prior to the shooting date. But the Ho Mann Jahaan team worked day and night to put the set back together in time so that the shoot wasn't delayed. 10) Ho Mann Jahaan is Sonya Jehan's first Pakistani film. 11) Sheheryar's real-life father Munawer Siddiqui is playing his on-screen father in the film. 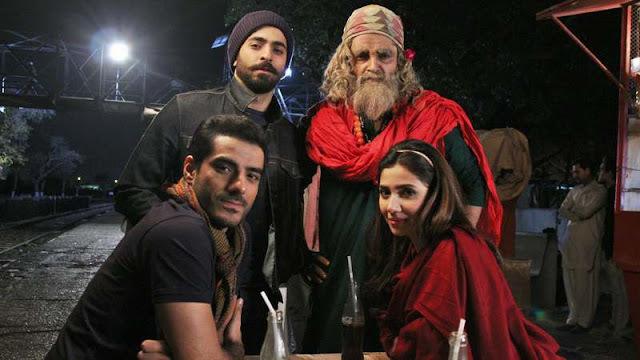 After tense scenes between the two, Sheheryar would actually go and apologise to his Dad!